A fantastic way to cook the season's sweet root vegetables and to help everyone to reach their five-a-day target. Preheat the oven to 200°C, gas mark 6. Place the vegetables, garlic cloves and half the sage in a very large, deep roasting tin. Season, then spray lightly with the olive oil. Roast, turning occasionally, for 30 minutes until nicely browned. Remove from the oven, add the cherry tomatoes and 500ml cold water, then cover the tin with a baking sheet or foil. Lower the oven temperature to 190°C, gas mark 5 and cook for a further 1–1½ hours, stirring occasionally, until the vegetables are very tender. Check the seasoning, stir in the balsamic vinegar, scatter over the remaining sage leaves, discarding the stalks, and season with freshly ground black pepper. Serve with baked saffron rice. For a grown-up supper, try replacing 300ml of the water with red wine. A teaspoon of fennel seeds added at stage 2 makes the ratatouille extra tasty, too. 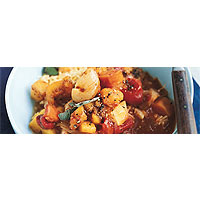 This hearty dish, with gutsy Mediterranean flavours, needs a full-bodied red wine to accompany it. Mont Tauch Fitou, South of France would make the perfect partner.